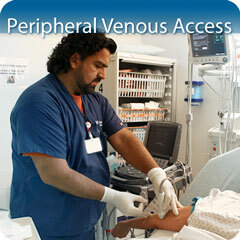 This Peripheral Venous Access Module will teach you how to use sonography to guide peripheral venous access in patients. 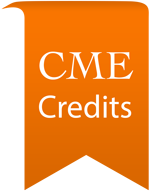 This Module provides comprehensive didactic, knowledge assessment, and hands-on training. 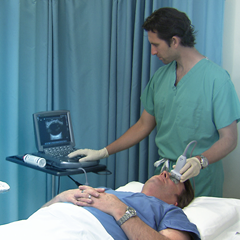 The needle-based procedure feature provides cognitive task training on ultrasound-guided needle-based procedures. 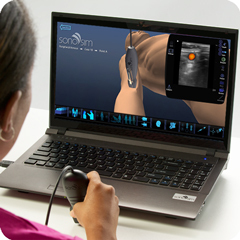 The SonoSimulator® provides you the opportunity to virtually scan real-patient normal ultrasound cases. The Peripheral Venous Access Module provides cognitive task training on ultrasound-guided peripheral vein catheterization. 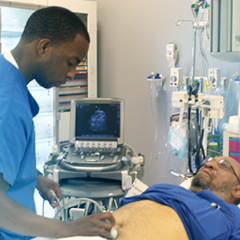 You will learn how to perform ultrasound-guided procedures in a convenient and risk-free setting. The American College of Emergency Physicians designates this enduring material for a maximum of 3.75 AMA PRA Category 1 Credits™. Physicians should claim only the credit commensurate with the extent of their participation in the activity. Approved by the American College of Emergency Physicians for a maximum of 3.75 hours of ACEP Category I credit.